AN ILLUSTRATION FROM THE CHILDREN'S BOOK DENSLOW'S HUMPTY DUMPTY, PUBLISHED IN 1903. IMAGE VIA WIKIMEDIA COMMONS. I recently learned that there’s a revolution coming. “I just got the feeling, y’know, that Trump’s got what we need to bring us back together,” the man in front of me says, swaying thoughtfully onto his heels. He’s maybe forty, white, sporting a ponytail, and wearing a loud Hawaiian shirt and mud-spattered work boots--an odd blend of Jimmy Buffet and the Brawny paper towel guy. The first debate has just ended, and although I’ve watched it in the ultra-liberal bastion of Portland, Oregon, I’ve found my way into a discussion with a bar mate who’s leaning Trump. I don’t think either of us are sure how the conversation started. I asked him about Trump’s stance on Muslims, and his answer has rambled pretty far afield. And I don’t really get it. “What revolution?” I ask just to make sure we’re in the same era. The man looks at me quizzically for a second, like he’s surprised I haven’t heard. “The revolution that’ll happen if he loses,” the man says, as gently as possible. Why would Trump play such a dangerous card? 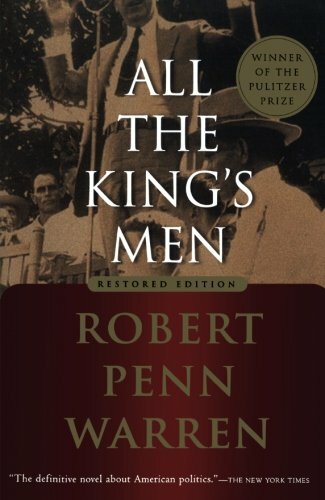 Robert Penn Warren’s Pulitzer-Prize winning novel All The King’s Men answers that question. Although it was written seventy years ago, the answer given by Jack Burden, aide-de-camp to rising populist demagogue Willie Stark might as well have come from Trump’s campaign manager. “The Boss isn’t interested in money,” Burden tells his mother. “What’s he interested in, then?” she asks. There’s a lot about Willie Stark that that bears an uncanny resemblance to Trump: both men are ill-tempered and rabble-rousing, bellicose and narcissistic. With anger at the core of their personas, both embody Carl Jung’s archetypal warrior: endowed with courage and a desire to fight for what they believe matters, which happens to always be their own self-interest. While both men are relentless self-promoters, cutthroat competitors, and truth-benders, Stark can boast of something Trump can’t genuinely lay claim to -- an up-by-the-bootstraps personal history that’s infused his political platform. He begins at the bottom and uses any means necessary to advance an agenda that’s centered around, yes, Willie Stark, but also very concretely on wealth redistribution, free healthcare, and advocacy for the poor. Whether Trump sincerely plans to advocate for the poor, white men who make up the majority of his fanbase is almost immaterial given the falsehoods that are the foundation of his campaign: He claims to be self-made although he’s inherited millions from his father and says he’s a fantastic businessman although he’s declared bankruptcy six times. There’s a shadow narrative in the Trump story that Stark doesn’t have: the possibility that Trump is using his supporters as a form of highly combustible political fuel -- and that he’s extracting it opportunistically, for his own benefit. And we only have his word to go on. Still, neither Trump nor Stark seem to care much about who gets burned along the way. All The King’s Men is the Trojan Horse that can offer a deeper understanding of Trump’s unlikely rise to presidential candidacy. Winning votes is thus a matter of combatting falsehoods, yes, but it’s also about inculcating a sense of believability. An air of confidence in fabricating the truth helps with that. "More than anyone else I have ever met, Trump has the ability to convince himself that whatever he is saying at any given moment is true, or sort of true, or at least ought to be true,” according to Tony Schwartz, who might be as qualified as anyone to make such an assessment. Schwartz became the unlikely ghostwriter of Trump’s autobiography and spent months listening on his phone calls and business dealings. DONALD TRUMP SPEAKS AT A CONSERVATIVE PARTY EVENT AT THE MARRIOT MARQUIS IN NEW YORK CITY IN SEPTEMBER 2016. IMAGES BY MICHAEL VADON VIA WIKIMEDIA COMMONS. Trump, like Willie Stark, understands that he is liberated from the burden of fact just so long as he continues to depict a reality that renders as True. No, his Trumping of the Truth doesn’t always work (when he recycled the ‘respect for women’ line in the final debate, Chris Wallace had to shush the crowd when they straight-up laughed). But it has worked well enough to win him the Republican primary, and well enough to keep him in the running for the most powerful political office in the world. His ghostwriter, Schwartz, assures us, it is all about attention: his need for it is “completely compulsive.” Trump is a master at keeping it all trained on himself. And once the spotlight is on him, he puts it to work. He tells them Their Story. A man born with a silver spoon in his mouth can’t invoke cow-milking stories to make himself more identifiable. Not even a Trumpian truth can bend that far before it breaks. And although they both rank among the one percent, Trump doesn’t have the same relatability problem that his predecessor Mitt Romney faced in 2012. Trump’s lifestyle is so elitist it becomes non-elitist. His penchant for gold-plated everything, parades of Eastern European models, gaudy braggadocio is something to aspire to for many in America, not something to resent in the way that so many derided Romney’s well-invested riches and understated real estate. Maybe Trump has won the masses because he acts out a fantasy of what America’s underclass might do if they they turned up with billions of dollars. Trump has a knack for mass appeal, even in exceptional circumstances. Case-in-point is his glib framing of sexually predatory language as “locker room talk” and sudden pivot to an attack on Bill Clinton. And suddenly, to his supporters, Willie isn’t a man guilty of corruption. He’s better -- more efficient -- than the best machine. And he’s not doing it for everyone -- he’s doing it all for you. If he’s getting down in the muck, he’s doing it for you. Every demagogue needs a scapegoat, a target for their supporters aggression and fear and anger. Trump has Islamist terrorism and Mexicans (and, accessed through slightly more coded language, African Americans). For Willie Stark, it’s MacMurfee, another figure in the state’s politics, and his fat cats in the city who don’t give a damn about the “hicks" that make up Stark’s fanbase. History shows that a demagogue’s exaltation and flattery of his supporters is enough to not only allay any anxiety about those who might get trampled along the way, it’s enough to cause the supporters to do the trampling for them. Stark, at the climax of his rallies, raises his fist and screams: “Gimme that meat axe!” And while examples of outright physical violence in the novel are few, the promise of it courses from Willie Stark as he bullies and intimidates and blackmails his way to the State Capitol and then, with those same tactics, entrenches autocratic power once he’s there. Actual violence has become an eerily routine phenomenon of Trump rallies, and was even carried out by a former campaign manager. Perhaps such physical altercations should not come as a surprise at rallies for a man who said he “could stand in the middle of 5th Avenue and shoot somebody and I wouldn't lose voters.” From actual throw-downs to verbal ones, Trump’s campaign has been slyly underlined with the spectre of violence. A spectre he has chosen not to sheath ahead of the election. And at least one pony-tailed man in Portland will be voting for him to avoid the mayhem that might come with his loss at the polls on Tuesday. John Lusk Babbott is a teacher and writer of fiction and non-fiction. His work has been featured in McSweeney’s, Enizagam, and Quiet Lightning. A California native, he’s spent the past six months on the road in the United States and is now settling in Portland, Oregon, where he’s finishing his first novel. Follow him on Twitter @johnbwrites.